The Queenes Good Night - DOWLAND, ROBINSON, JOHNSON, ALLISON.. The reign of Elizabeth Tudor (15581603) brought with it a period of splendour for England, within which the lute experienced its moment of glory. In paintings from this time convivial scenes featuring performers of harp and lute are often depicted. Well known melodies of the epoch, as well as harmonic sequences such as Bergamasca, Ruggiero, Callinoe, Conde Claros and various Dumps were used by performers when they gathered to improvise together. Sometimes the music was dedicated to a wellknown personality of the court such as was surely the case with The Queenes good Night, inspiring sweet dreams for Elizabeth. 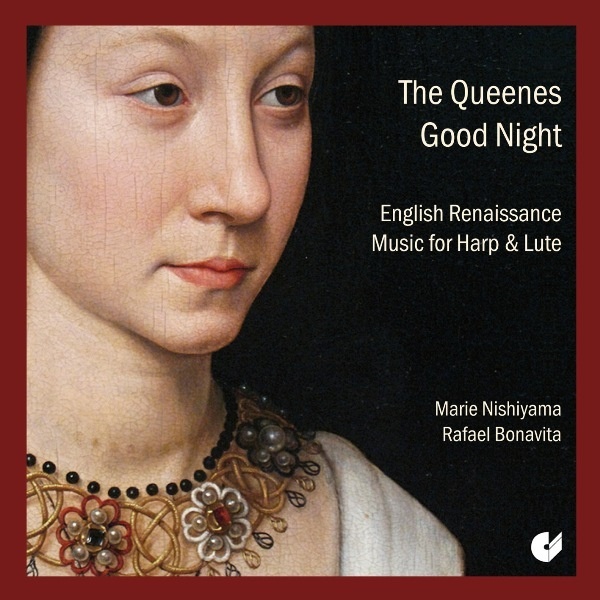 For this recording Marie Nishiyama and Rafael Bonavita have mixed the colours of harp and lute, the characteristics of each instrument to create a dialogue of sound between the two. A dialogue that goes – as does this repertoire – beyond epochs and styles, beyond its own time.